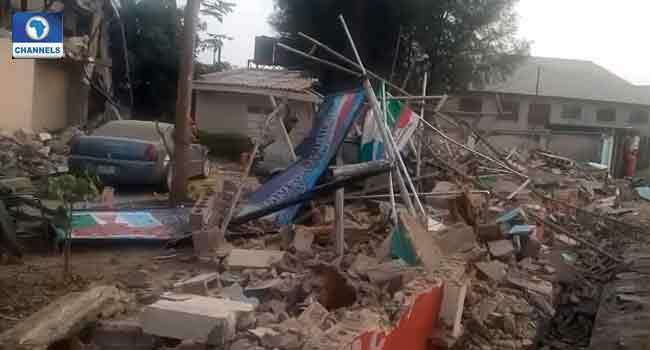 The factional secretariat of the Kaduna State chapter of the All Progressives Congress (APC) located along number 11 B Sambo in the state capital has been demolished in the early hours of today (Tuesday). Party sources told Channels Television that the secretariat belongs to the faction loyal to the suspended senators representing Kaduna Central, Shehu Sani and that of Kaduna North zone, Suleiman Hunkuyi. The demolition order was allegedly carried out by a bulldozer, accompanied by military personnel. It was opened last week as a parallel State APC office due to the inability of the group to reconcile with the State party organ. The property, a one storey duplex was said to belong to Senator Hunkuyi before it was converted to a State Party Secretariat last week. On Sunday, the group held a meeting at the Secretariat, where they claimed to be the recognized state chapter by the APC national leadership. KAPSUDA’s Director-General, Ibrahim Husseini defended the demolition as he said the move was facilitated with assistance from sister agencies aimed at restoring “order” across the state. “This morning a building on 11B Sambo Close was removed for flagrant violations of land use and non-payment of ground rent since 2010,” he said. This illegal violation of use, he explained, had begun to distress neighbours who were being forced to endure an influx of thugs and blockage of the road. Husseini further reiterated the determination of the state government in discharging its responsibility on land matters in the state. To this end, he called for the utmost cooperation by the public with all our agencies.